Today we wake up early with the drill down, get Calista to school on time. Her first day of Kindergarden and I am hardly emotionally ready. 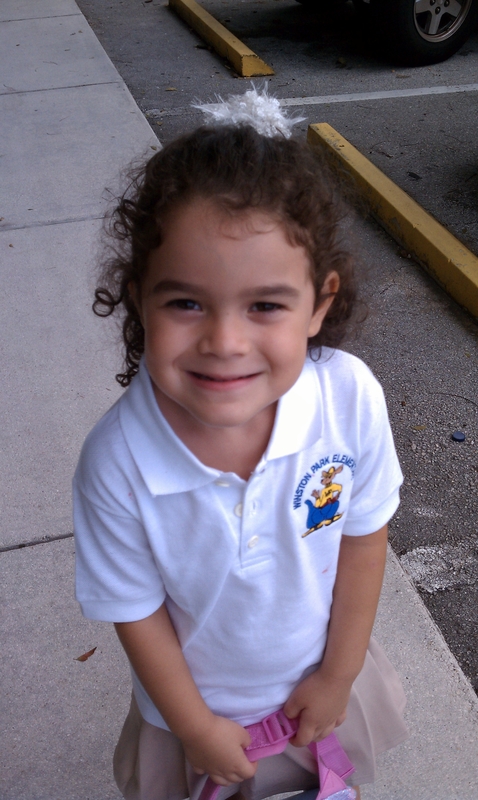 My baby girl has been going to VPK but something about that first day of real school that brings you to tears. As I walked you in today, my thoughts and worry drew me to think of all the positives and negatives you would be facing going forward. As we walk down the hallway headed toward her room, we bump into her friend Melanie, she was in another classroom but in the same hallway. My baby girl walked in a bit hesitant and sat at her table. Her new friends sitting with her are Philip, Carlos and Anne. Her daddy and I slip in a few pictures, got a few instructions from her teacher, and walked toward the door. My baby’s expression was memorable. A non smile expression surfaced her face. Looking at us in a sort of timid and unpleased way she softly cracks a smile at us and directs her view down to the desk. We make our way toward the door and I wave at her one last time. We step out to the hallway and I feel the emotions start to overtake me. I say to myself, “why are you so emotional, you have done this before. You have left her in the hands of the teachers since she was two, why this sadness now.” Walking down the hallway I see another mother rubbing the tears from her eye. She leaned against the wall and sobbed like a baby girl. Her sadness will be something I remember years to come. That moment my emotions came and as we hit the door to leave the hallway I let it out. Why does kinder garden hurt us the mommies so much? It’s the moment when our babies take the first leap to adulthood. They are now on their way to educated themselves to one day hold a place in our society. My baby girl, in her white uniformed shirt and little light brown skirt with her hair “half of it down and half of it up” as she would say, today walk into a classroom to start her journey into adulthood. As I brushed away my tears I prayed to Jesus to keep you safe always. For your a soul of an angel, my angel that god has so gracefully given me.